The UPS Store in Gold River is looking for a permanent part-time Customer Service Associate. As the first person our customers see, you will set the tone for our store. Therefore, we are looking for someone with excellent interpersonal skills and a warm demeanor. Along with making our customers feel welcome, you'll be responsible for managing incoming calls, processing packages and mail for shipment & assisting customers with inquiries regarding our various services. We'd like all applicants to have solid prior experience in a similar retail setting. Must be proficient with Windows based PC. Notary Public commission, Live Scan Fingerprinting certification a plus. The store hours are 8:30am-6:30pm Monday through Friday & Saturday 9:00am-5:00pm. Great job for college students! If you think you might be a good fit for our store, please please stop by dressed for success to fill out an application. We are located at 11230 Gold Express Dr., Suite 310, Gold River, CA 95670. Email submissions are accepted with attached resume in a pdf format. Weekend availability is required. 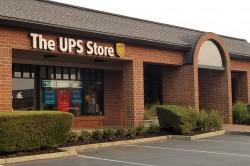 Local franchise of The UPS Store in Gold River. We do UPS, USPS & DHL shipping. Offering packaging services/supplies as well as domestic and international shipping. We also provide printing/copying services, Notary Public and Live Scan Digital fingerprinting, private mailboxes & office supplies.